We have a tendency to bask in the glory of our past, and Shimla has a rich history, but that is the only thing left of it! The fast paced development and rampant constructions all around the City has left a generation wondering what has happened to this City. The one safe place for girls and women too has been encroached upon by the authorities and is now clearly an ‘addaa’ (warren) for dating, drug abuse and alcoholics! Yes! This is the present status of Ladies Park, the only open and natural park located right in the heart of the City, on Mall Road, that was earmarked for women and children, since it was handed over by Rajkumari Amritkaur on 6th July 1937. It is no longer a safe haven for girls! Being a next door neighbour to the Park’s premises, it is hard to ignore the present activities. One just cannot close eyes and say that nothing is wrong, but it is time to step up and STOP ‘any—all’ illegal activities taking place in this Park. Now, men, boys, girls, women alike seek haven in the cool environs of the park to the dislike of many who totally disapproved of it. Administration/Politicians, it is time to wake up! The Himachal High Court stepped up in saving the park’s sanctity when it banned political rallies in 2003, saying, “Such activities defeated the purpose for which the Park was developed”. This was an after effect of a PIL seeking for better development, to which the court had replied that the park should be developed for the entertainment, relaxation and amusement of the public and allowing such activities would defeat the very purpose of the park. A sanction of Rs 4 crore in 2007 for the redevelopment of the Park under the Jawaharlal Nehru Urban Renewal Mission, a central government sponsored project, too left the people of Shimla thinking. The renovations were a minimal, few swings were installed, the area got a couple of lights, a stone walkway was laid around the premises and a grass park was created with crores exhausted. Then again in 2012, the Himachal Tourism department undertook renovations after funds received through the Asian development Bank, the refurbishment of the Park began, thereafter an effigy of Rani of Jhansi was instituted and the new, “Park”, had swings and hygienic public toilets. With this new look came a new name ‘Rani Jhansi’ park. But those who love its history, still call it as Ladies Park. The premises were closed for public for almost two years or more during the period. The MCs restoration and renovation plans included providing beautiful fountains, children parks, a public convenience building, etc., while also connecting the upcoming rope way project from the New Inter State Bus Terminus to the Mall,to be terminated near this Park making it a congregating point for tourists and visitors. A purely commercial venture at the cost of destroying Heritage! But all this at what Cost? By displacing women and girls from this place, by relocating their institutes to another end of the city, in a god forbidden place not at all suited for their safety! An important historic aspect about this park is the location of two centres for women and girls, where they are taught vocational courses such as stitching, knitting, painting, art and craft and beauty techniques. The All India Women Council (AIWC) and National Council for Women in India (NCWI), have been operational since 1937 that have provided a platform for women to gain financial independence by picking up various vocations. The AIWC and NCWI together currently help over 200 underprivileged women attain financial freedom every year. The Presidents of these Institutes, Gargi Gupta and Indira Seth, have dedicated their lives towards upliftment of these girls and teaching them through thick and thin. They have been instrumental in helping these girls build independent lives, a way to contribute to their financial well-being. The sad part, that these centres are being forced to be relocated from the heart of the city by MC Shimla, to Chaura Maidan, below a parking lot, which from all angles is far from safe. Yes, they may have lost the legal battle in the highest court due to a debauched representation, but a government which takes pride in the ‘Beti Bachaao, Beti Padhao’ slogan, is now forcing them to move out? Joint Secretary of NCWI, Asha Sood said, “It was unfortunate that we are being forced to vacate the premises, think about where all these girls will go. Ladies Park is a central, safe and an approachable place for all women and college girls that come to attend courses here, the minute we move out to the new premises, even parents will be hesitant to send their kids in such a dingy place. Secretary AIWC, Abha Sood added that the new designated place is below a parking lot and is surrounded by hotels and offices, which will make it difficult for the girls to come to attend courses. She further added that the nuisance of boys and girls roaming freely even in Ladies Park is a cause of concern and many a times we see girls and boys in compromising position from our windows. It saddens us to see these kids behave in such a manner. They both added in unionisation that Ladies Park was once a very safe place. Parents could send their children, especially girls here to play without any supervision as they knew kids would be safe. A guard was always posted at the big gate who barred entry of boys and men in the Park, but now, as you see it has become a dating playfield with all kinds of objectionable activities taking place. 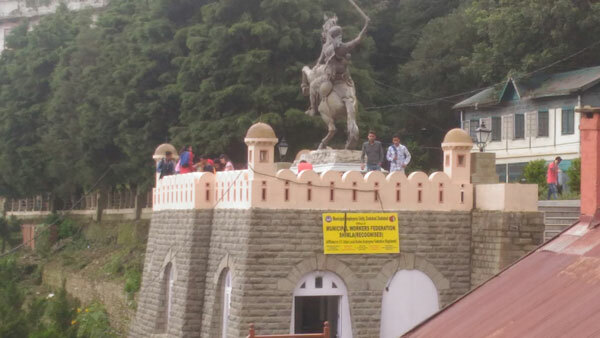 The recent addition in the park of an office of the Municipal Workers Federation Shimla, has further given a free entry pass to men, it just adds to the fact that the park is becoming a place open for all. Speaking about the issue, Inderjeet Singh, Mall Road Ward Councillor said that an incident about breaking and entering into the Centre by few miscreants was reported and action was being taken as discussions were on with the Commissioner to post a full time guard on duty. However, he did not say much about the relocation of the centres. While talking about showcasing Shimla’s Heritage through a light and sound show, Himachal CM, Jai Ram Thakur, needs to pay heed to what the people of this City really want. A safe haven for their girls, a protected park which once offered all such facilities and a promise that “betiya iss dev bhoomi main surakshit rahengi”! Simply want to say your article is as surprising. The clarity in your post is just great and i can assume you are an expert on this subject. Well with your permission let me to grab your RSS feed to keep up to date with forthcoming post. Thanks a million and please carry on the rewarding work.